I'm a plush artist, and I love cute animals, dolls and stuffed animals, crafting, sewing, and having tea parties. I’m inspired by vintage decorations, animals and nature. Hi there! I was curious where you purchase the fabric for your plushies, could you tell me please? 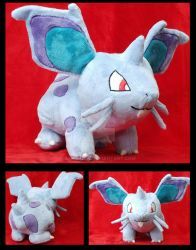 I'd like to get into plush making, however I dont know where to find the right fabrics. Ooh, thank you! Let's hope my altertion skills are good enough ^-^"
I can't believe I wasn't watching you already. I love your work!